The DM400R step fits at the rear door of a RWD van with sufficient overhang to span the bumper when deployed. It can be mounted either side of the entrance to clear a tow bar hitch. The step is deployed and stowed by hand and held closed by anti-rattle spring clips. 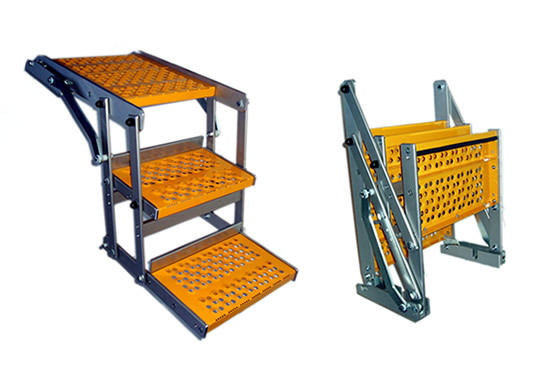 The step consists of anodised aluminium struts and side arms with powder coated punched steel treads and platform ramp. All pivot joints have nylon bushes and high tensile steel bolts. The step unit is mounted on two steel plates that are simply bolted to the vehicle floor. There is a choice of mounting plates covering different vehicle types. The Company has a policy of continual improvement and reserves the right to change the product specifications without notice.